Gold appears extremely bullish in most of the world’s currency. Probably more than it has ever been in the last 30 years. However, there is one currency in which gold is looking really bearish. 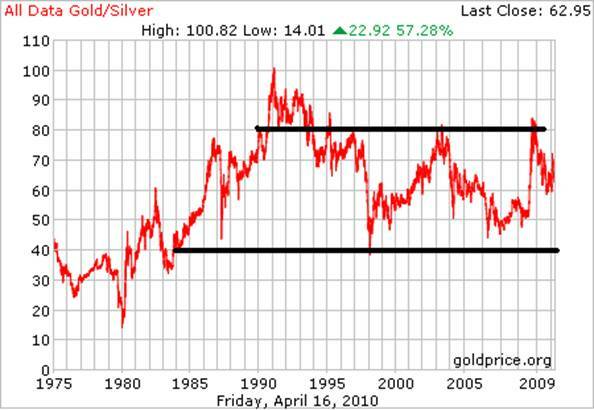 Below is a long term chart of the gold/silver ratio, which translates to the silver price of gold. The current price of ounce of gold in real money is about 62.95 ounces of silver. If you look at the long term chart you will see that the highest price was about 100 ounces of silver and the lowest about 14; this is quite a ridicules fluctuation in the ratio between two of the most stable metals and forms of money on this planet. This big fluctuation is not a reflection on gold or silver’s instability, but it is indicative of the flawed monetary system we have today . What one can also see on the chart is that the ratio has strong resistance around the 80 level and there is good support at the 45 – 50 level. The ratio has been range bound for almost 2 decades between the above mentioned support and resistance. 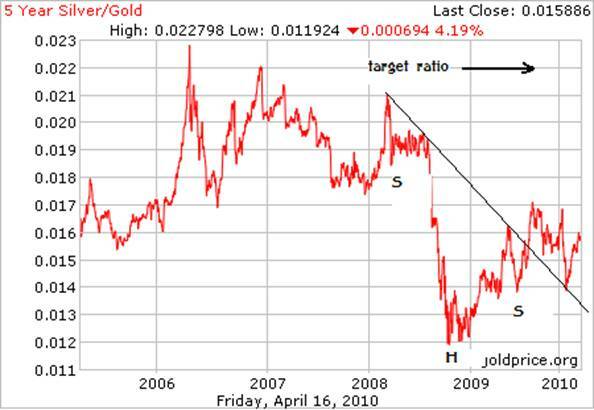 Notice that even during the market crash of end 2008; the ratio did not successfully breach the 80 level, despite silver being really weak. After falling back to 60-61 since the crash of 2008, the ratio has tried to challenge the 80 level again but has failed twice (can be seen on a short term chart) at the 70 level. This is a bad sign for gold’s price in silver and it is an indication that the momentum is on the side of this ratio going back to the 40-45 level (relatively fairly soon in my opinion). On the chart of this ratio, a head and shoulder pattern has developed. 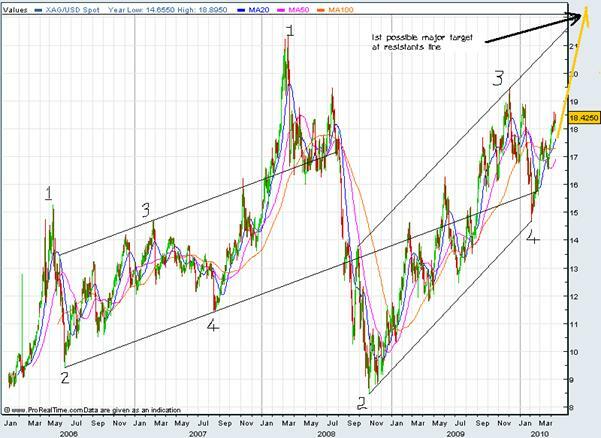 Below I have illustrated this on the silver/gold ratio instead. As you can see there is a reverse head and shoulder pattern developing. The price has broken through the neckline, has come back to test the support of that neckline, and is ready to take off to the target of 0.022 or alternatively stated as 45.45 in terms of the gold/silver ratio. What is also interesting is that this pattern is almost a replica of the extremely bullish pattern on the silver chart. These are all good signs for silver as well as for gold going forward, since gold’s nominal (fiat) price normally rallies when silver’s gold price rallies. Why is the case for silver so extremely bullish today? To get to this reason, one has to know what silver is. If one does not know what silver is then one will not understand what will drive the world’s great silver rush. Silver has many uses, possibly superior to any metal or at least the equal of any. However, there is one use that makes the other uses virtually immaterial. That use is silvers’ use as money. Here we specifically refer to money’s feature called: store of value. Now however, silver’s use as money is not quite as active as it used to be. Silver was demonitized many many years ago. Therefore the paragraph above, though true, is not quite an “active truth”. Silver’s investment demand, which is a measure of its demand as a store of value, is significantly smaller than demand for industrial and other application. If silver has realised its true destiny as money, it should be the other way around; investment demand should be relatively much bigger than demand for industrial and other application. What is the event or circumstance that will activate silver’s use as money, especially its use as a store of value? That event or series of events (building up possibly to a main event) is the collapse of the current monetary system. As I have written before, the monetary system is extremely fragile and there have been clear signals that it should likely collapse under the weight of the high debt levels today, as it has in the past. Over the next couple of years, as these events are unfolding and causing people to search for an alternative to fiat currencies, the time will come, and now is, that silver’s investment demand will explode and will eventually take the price of silver to $ 100 and beyond, and hopefully to where no fiat price exist. I have highlighted two patterns on the chart, to illustrate my fractal analysis. Both are marked by 4 points to illustrate how they are similar. The scale of the second pattern is bigger than that of the first, so if the rest of the pattern plays out the same as the first, then we should have a big rally that has started already at point 4 (the one on the right side). The first target is the resistance line as indicated on the chart. If you would like to know more about my fractal analysis you can purchase my Gold or Silver Fractal Report at $ 50 (R 350) each. For more details contact me via email (below). I am so confident of my gold and silver analysis that I offer to refund your money should gold not hit $ 1300 dollars by 31 July 2010 or Silver $21.50 also by 31 July 2010. You are dead right... Silver @ 21.50 & Gold @ 1300. .Great Analyses. Whats next... ? Is silver going to $27 ?? 29 Sep 10, 05:52 Silver to $47? 29 Sep 10, 09:41 reverse SHS? I would love silver(or any market) trading to $47 or $100 as I will then hope to ride on it. Or if it collapses from $47 to $3 as I would also hope to ride on it. Be it as it may, however, it is stretching the imagination a bit too far trying to squeeze in a inverted SHS in the 5 year gold/silver chart above. Too many commentators recently have been invoking the SHS pattern willy nilly to suit their forecasts that my hairs stand on their ends now whenver I see the letters SHS!!! Not only a reverse SHS, but also a hyper-bullish wedge pattern that has repeated with huge breakouts 4 times already since 2001, and has repeated with about the same frequency of every 2 years. Did you look at the chart at link below?